Not sago or aesthetic taste but street food is always strangely attractive, for both indigenous people and tourists. Someone mentioned the shortest path to the heart is through the stomach, so probably the fastest way to understand and love a country is also by enjoying its food. This article provides excellent photographs of Vietnam street food, best street food in Hanoi, and street food in Saigon. 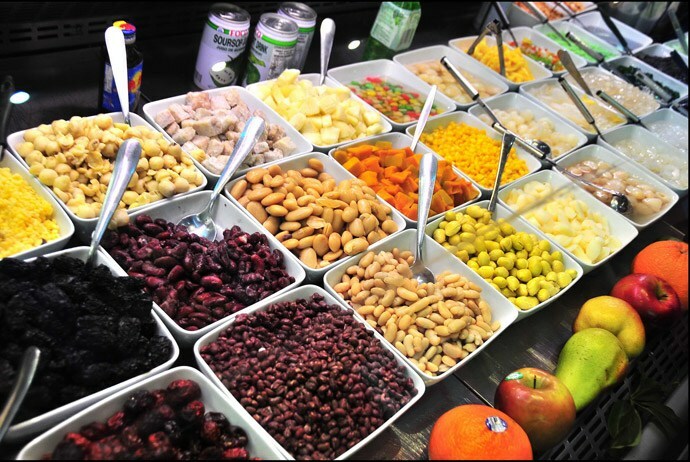 Street food, curb food, or sidewalk food is the foods and drinks which were prepared or willing to be processed and served according to customers’ requirements. Street food is sold on the pavement, curb, on the street, in the crowds, or other public places, such as supermarkets, parks, resorts, entertaining centers, outdoor dining food streets… Commonly, street food is sold on the mobile or temporary restaurants, or on a mobile trolley. According to the concept of the World Health Organization (WHO), street food is the food and drink which are made or processed, cooked on the spot, ready to eat and are sold on the street or public places. Stepping onto Vietnam’s streets is like entering a large, bustling kitchen, where you can easily see something is being fried, steamed, boiled, or rolled; pots of fragrant and hot Vietnamese noodle soup on the coal burners and peanut-studded sticky rice balls are steamed and wrapped in newspapers. The food is fresh, fast, fragrant, and second-to-none in terms of the availability and diversity it brings about. 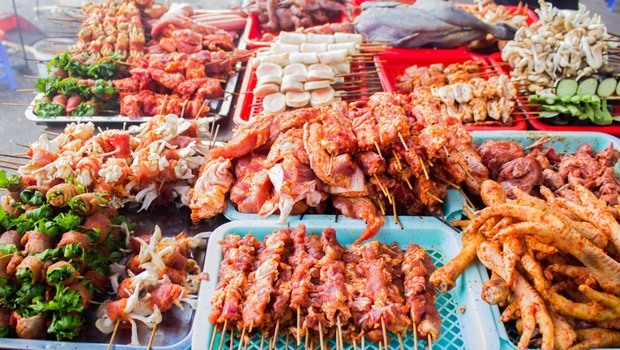 This Vietnam street food article shows everything visitors can eat right on the street when they come to Vietnam. The plentifulness of street food dishes and cooking methods, including boiled, rolled, fried, or steamed, combined with beautiful photographs of every dish will be revealed. 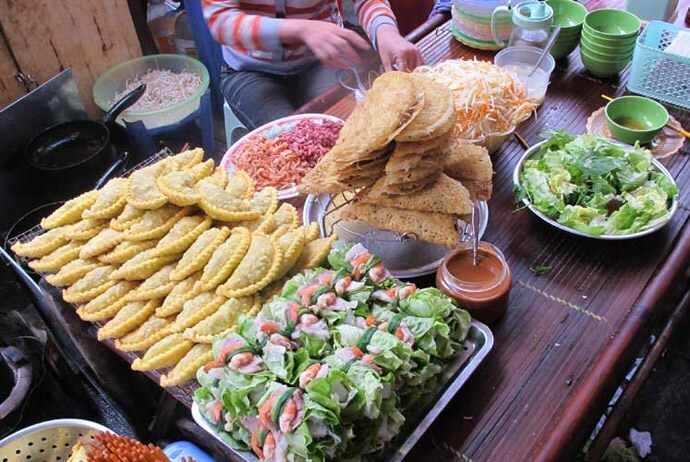 Hanoi is called the “paradise of Vietnam street food”. The “maze-like” alleys of Ha Noi Old Quarter and the more traditional Truc Bach lake area are crammed with makeshift storefronts and stalls. Every of them bears toy-sized plastic stools and advertises what they sell with the well eye-catching signs out front. A lot of vendors just sell 1 or 2 dishes, and since Vietnamese uses a Roman script, it is simple to tell what they are, letting you know some basic vocabularies about street food. 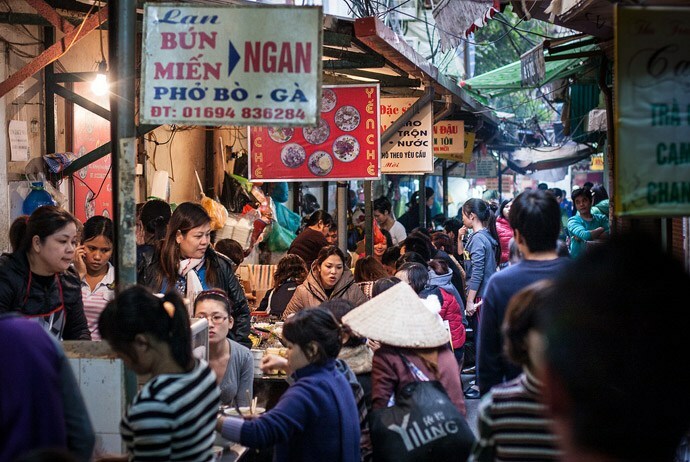 Here is an overview of Hanoi’s diverse street food – so delicious! This is a specialty of Hanoi, especially Hanoi Old Quarter that can not be ignored by any foreign visitor coming to Vietnam. This dish contains fresh vermicelli served with barbecue, and a special dipping sauce which was exquisitely mixed from fish sauce, sugar, vinegar, chilli, and garlic, and a kind of pickles made from green papaya and carrot. 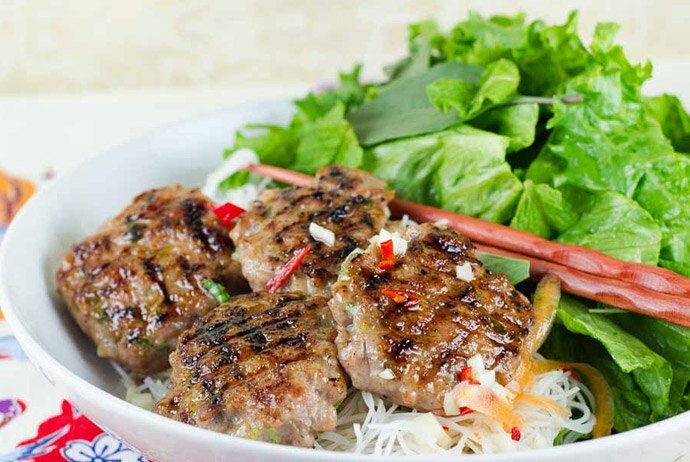 Bun Cha is the favorite dish of many Western visitors that they could not forget when leaving Vietnam. 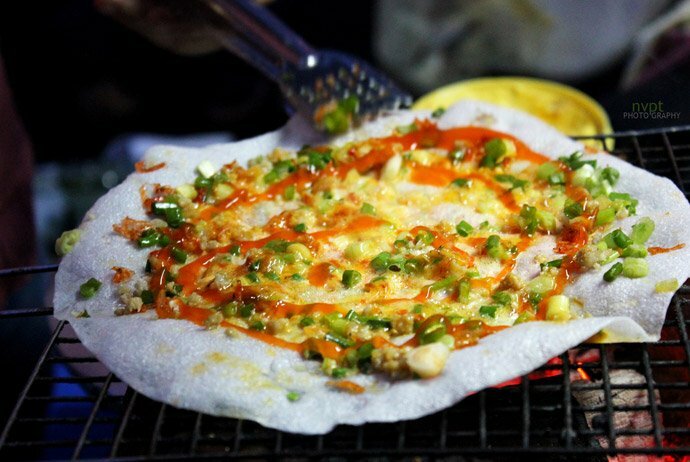 This is the most famous street food of Vietnam in the field of international cuisine. A bowl of beef or chicken noodle soup makes all tourists enthralled. Many tourists even want to learn the recipe to bring back to their own countries to process, enjoy, and satisfy their cravings. 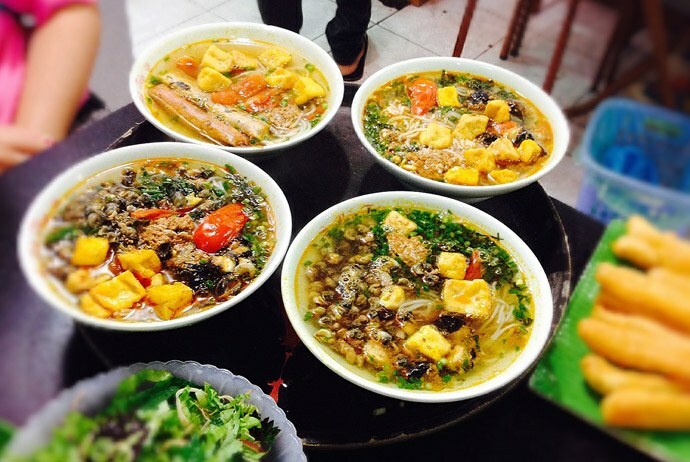 In addition to the famous familiar Pho restaurants like Pho Thin, Pho Ly Quoc Su …, there are many other special variations of Hanoi noodle soup which would make every tourist miss this speciality when they leave Hanoi such as Lan Ong chicken mixed noodle, Tran Hung Dao beef mixed noodle, Nguyen Sieu fried noodles and fried pig intestine. Bun Bo Nam Bo is not originated in Hanoi and it is totally not a Hanoi’s speciality. 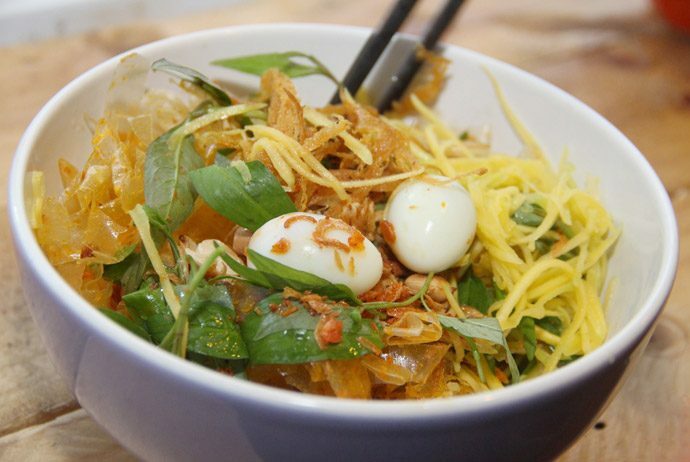 However, with its great “coverage” in the capital of Vietnam, Bun Bo Nam Bo is an irresistible delicacy for visitors. 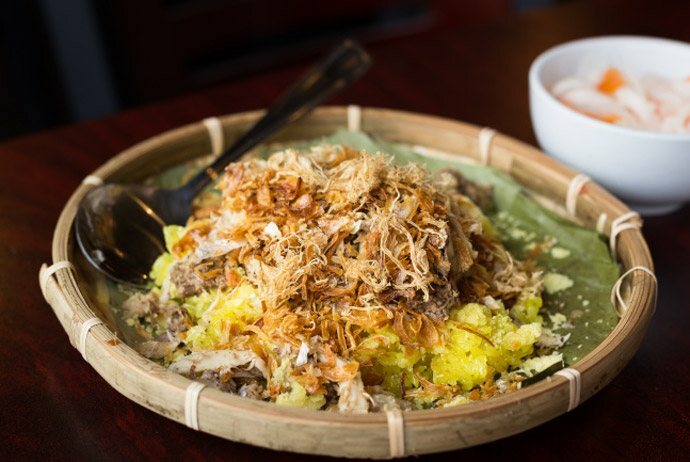 Vermicelli will be mixed with vinegar, fresh vegetables, green bean sprouts, onions, and beef, bringing about the fresh, delicious taste of the excellent Southeast Asia culinary. Bun Bo Nam Bo sold on Hang Dieu Street is most famous in Hanoi, and this dish is gradually becoming a great street food in Hanoi. 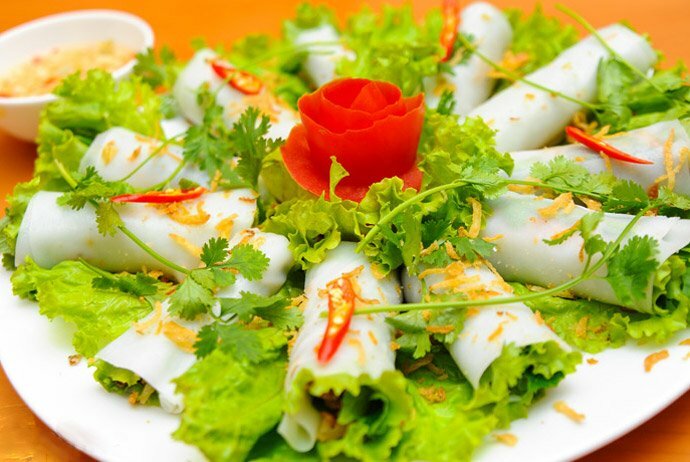 Fried spring roll is also closely associated with Vietnamese cuisine. This item is widely sold everywhere from the luxurious restaurants to the streets in Hanoi. Typically, fried spring rolls are served with vermicelli and grilled meat balls, but there are places selling spring rolls alone, dipped in sweet and sour sauce with their own secret recipes which nowhere has the same. 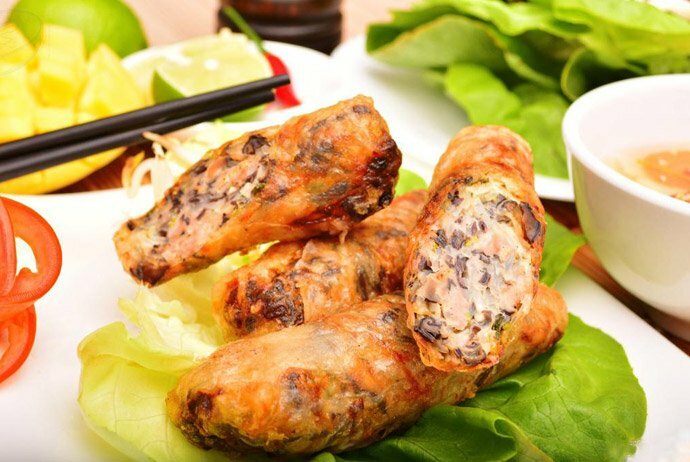 That is the reason why when mention Vietnam and Hanoi, many tourists have found out in their heads the image of fried spring rolls. 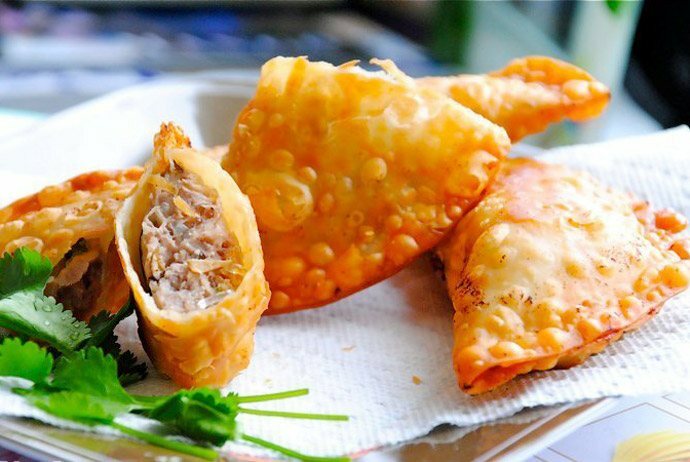 Pillow cake, with the crunchy crust and the soft, yellow stuffings with fungus, vermicelli, pork … is one of the scrumptious street food dishes for visitors to Hanoi. Fried pillow cake is served with fresh vegetables and sauce. It can be wrapped in rice paper for greater impression. 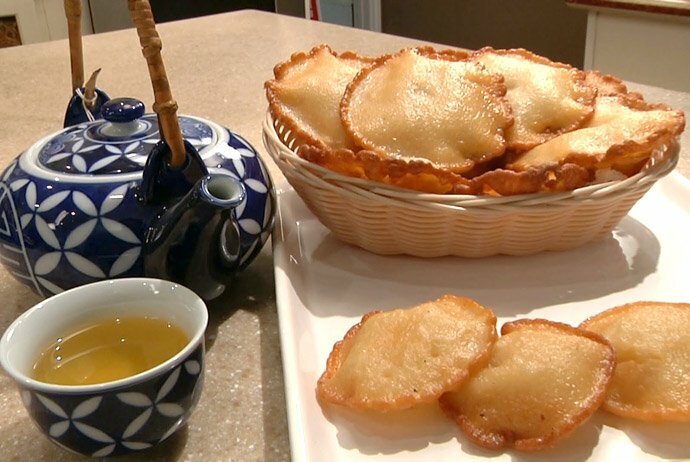 There are some inns famous for delicious fried pillow cake in Hanoi that you can represent to a foreign friend, such as Doi Can fried pillow cake and Ton Duc Thang pillow cake. 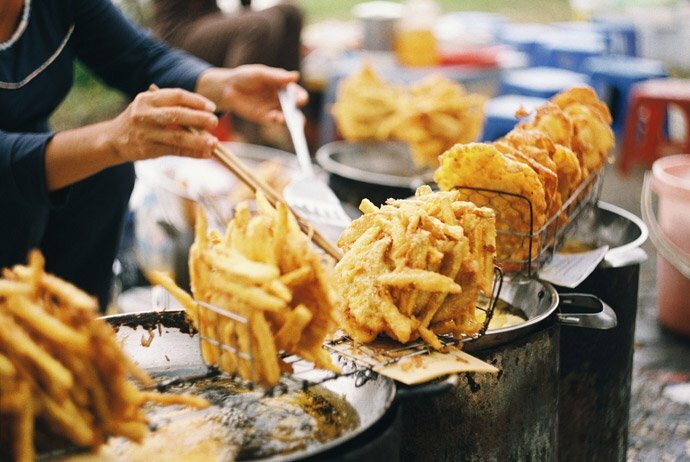 In fact, fried pillow cake is also one of the best street foods in Hanoi tourists should try! 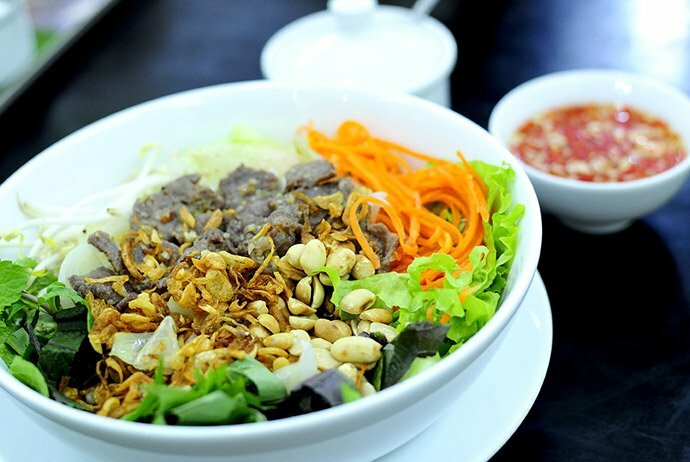 Rolled noodle has been listed in the list of food in Hanoi for nearly a decade. Pho Cuon is a fresh, cool dish with fried beef, which takes the special favorite of foreign tourists because of its delicious taste. Moderately sliced noodle pieces will be rolled with fried beef and vegetables, served with sweet and sour sauce with some slices of fresh papaya. This speciality is sold in many places in Hanoi, but Ngu Xa is still the most popular destination when it comes to Pho Cuon. This is also a delicious street food in Hanoi which is highly appreciated by a lot of international culinary magazines. 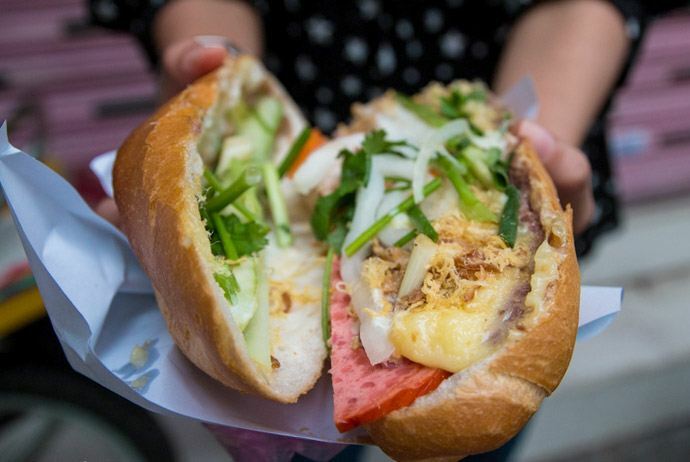 Bread, stuffed with meat, pickles, eggs, sausage, or pâté, is the favorite dish of many Vietnamese people, and it also makes Western infatuated when they arrive in Hanoi and try this dish. 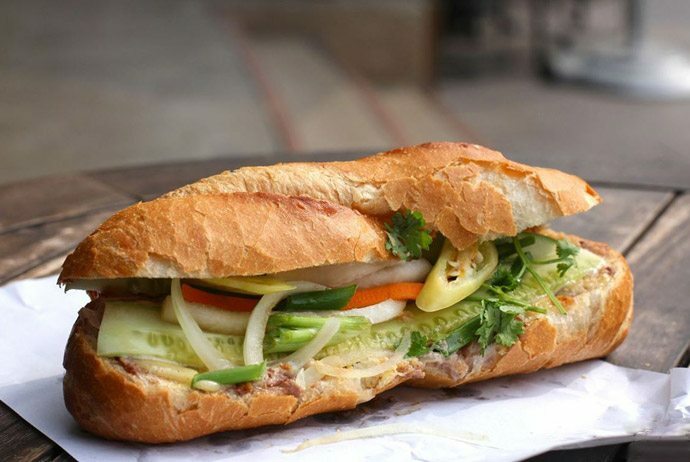 From the bread which is originated from France, Vietnamese people have many variations of this delicious sandwich, making anyone who has tried it can not forget. People often remember about Hanoi’s autumn with the sweet fragrance of alstonia scholaris and the fresh flavor of Vong village’s green rice. And winter? Perhaps no one can forget the “cold northeast monsoon” and the smell of grilled corn spreading around the streets and corners in Hanoi at every winter night. Hanoi boiled corn is available in every season. In many alleys in Hanoi at nights, it is easy to hear the cry “hallo hallo who wants boiled corn…” of the barkeepers. The cry is familiar and echoing in the quiet night, making people who have been living far away from their home – Hanoi – cannot forget. 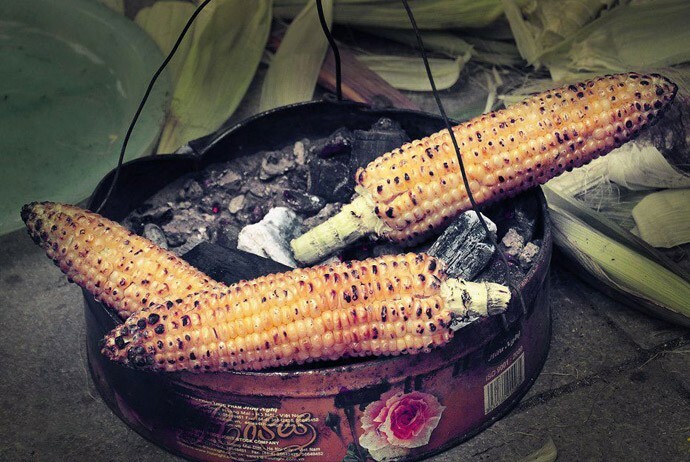 However, grilled corn is just available in late autumn to winter. When the late autumn winds start becoming cooler, when it begins to be cold, when the cold hands need to find out a warm place, then grilled corn is on its own season. Goodness pleases people so that it is right on the time when the Red River banks have been suffused with corn. Looking at the corn wrapped in green silky skin and the strands begin to turn to red, we will realize that the season of aromatic grilled corn is right on the streets. 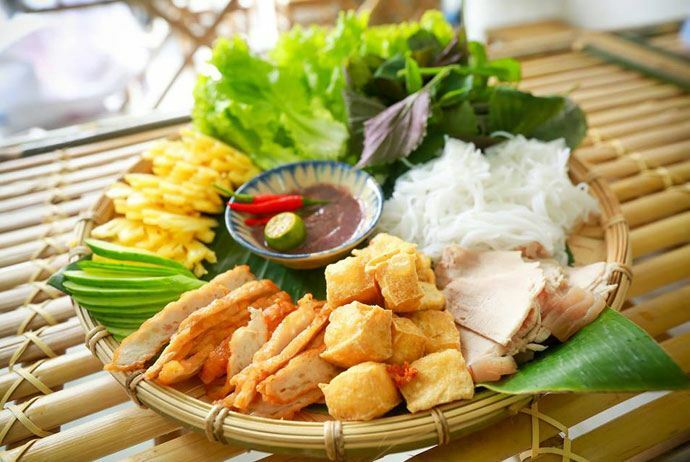 Vermicelli served with tofu and shrimp paste or shrimp sauce is a simple, rustic dish in the Northern Vietnam’s cuisine in general and Hanoi’s cuisine in particular. This dish is usually served as a snack or a light meal. The main ingredients of Bun Dau Mam Tom are fresh vermicelli, crunchy fried tofu, shrimp paste mixed with lemon, chilli, and sugar, and it is served with aromatic vegetables such as shiso, marjoram, basil, lettuce … Like other folk dishes with cheap price, Bun Dau Mam Tom attracts many people with low income so that the earning of the sellers are really high. Like grilled corn, Vietnamese youtiao, boiled snails…, fried banana cake and fried potato cake are the two cakes that everyone in Hanoi loves whenever the winter comes. Strangely, the cakes are almost neatly, submerged with oil, sugar, and powder but many people love them so much. In fact, the winter would not be winter without small mobile fried banana, potato cake diners on the sidewalks. The snail vermicelli bowl is always colorful with fried tomato, fatty snails, and yellow banana and tofu. The specific taste of snail vermicelli is the perfect combination of the greasy broth and the light sourness of rice vinegar. When eating snail vermicelli, people can add some sliced banana flower and raw veggies for a vermicelli dish with full flavor. In Hanoi, there are plenty of sticky rice dishes for diners to choose such as steamed sticky rice, black bean sticky rice, peanut sticky rice, corn sticky rice, crab pie sticky rice, chicken sticky rice, Gmulticeps wall. sticky rice cake, braised meat sticky rice, braised eggs sticky rice, salted shredded meat sticky rice, … No excepting anytime from the early morning to the late night, from winter to summer, whenever Hanoians are craving, they can always find out and enjoy the full taste of fat, fleshy, sticky particles of this mouth-watering dish. 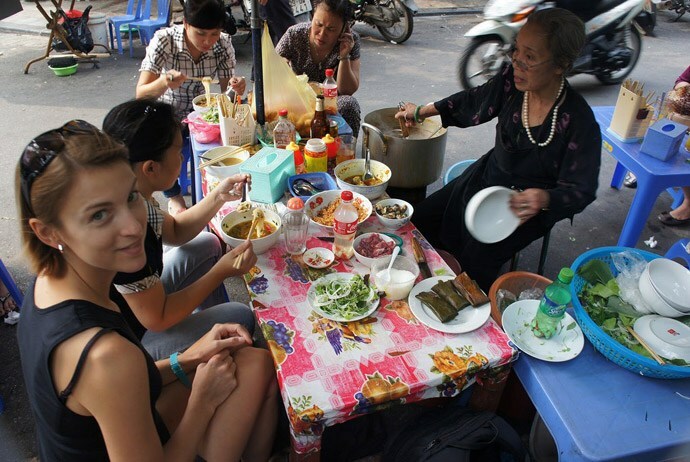 Street food in Saigon (Ho Chi Minh City) is considered the best Vietnam street food. 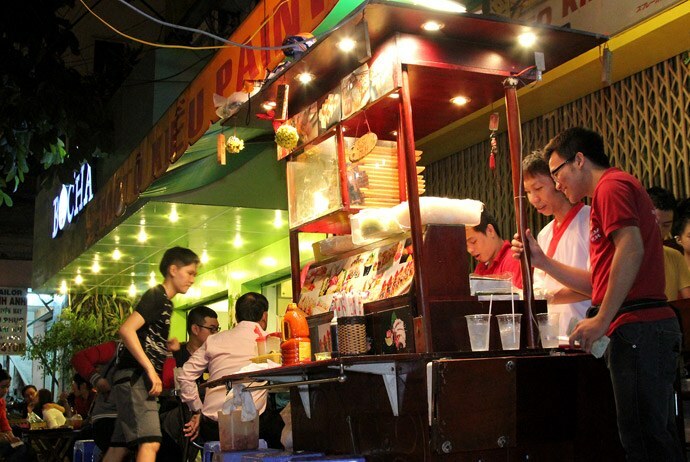 The picture of street food in Saigon permeates every neighborhood, district, and alleyway. 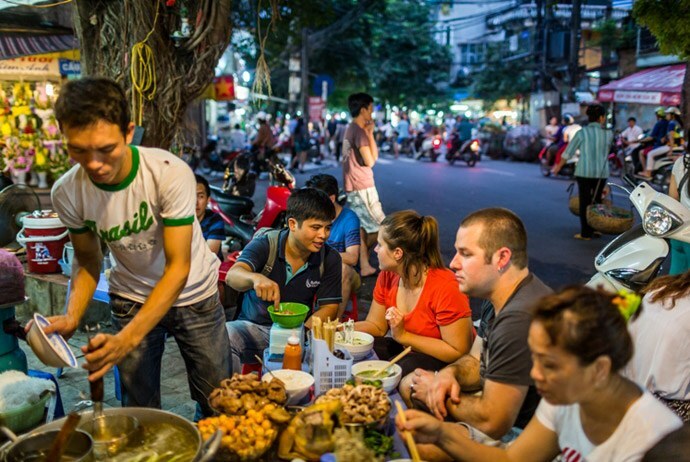 Saigon boasts so many street food outlets that the city feels like a giant open-air diner. Every day, tens of thousands of street-side eateries pick up tasty food with cheap price in an informal space – on the sidewalks of the city. Street food is not just wrapped into “food”. In fact, it is about the ambience and atmosphere around. As many people say, if you take street food to your home, would not taste anywhere near as delicious as it tastes on the street. 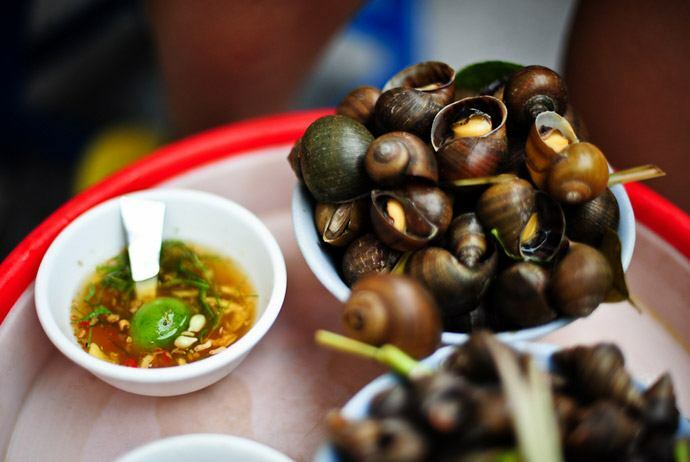 Enjoying street food is definitely one of the best things you should do in Saigon. 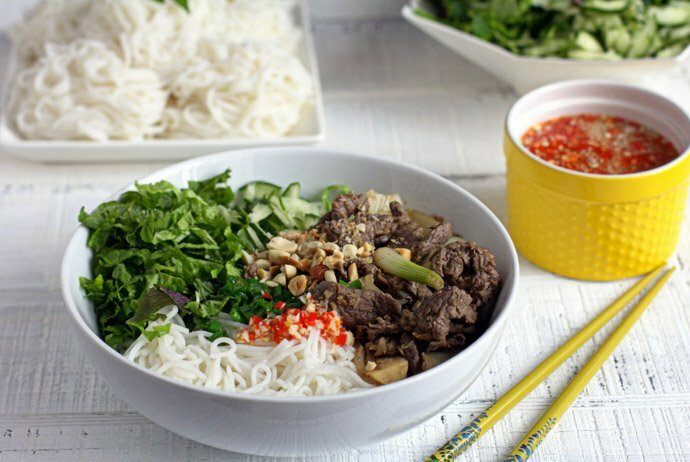 Pho is a traditional dish of Vietnam, and it can also be considered as one of the most typical dishes for Vietnam’s culinary. 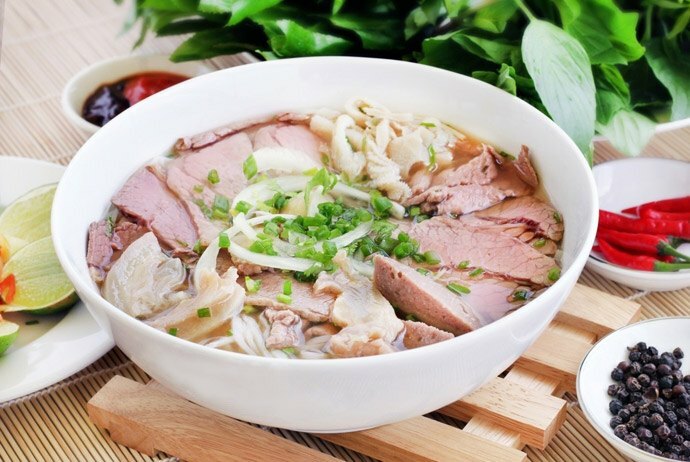 The main ingredients of the noodle soup are the noodle and broth (or “nuoc leo” – the way to call “broth” in the South) with some slices of meats. People usually opt for beef noodle soup, but there are also chicken noodle soup, pork noodle soup, and shrimp noodle soup for customers to choose. When Pho came into Ho Chi Minh city, it still retains the original flavor but the restaurants will give customers a dish of raw vegetables to serve with the noodle soup, including odor ship, basil, and bean sprouts. 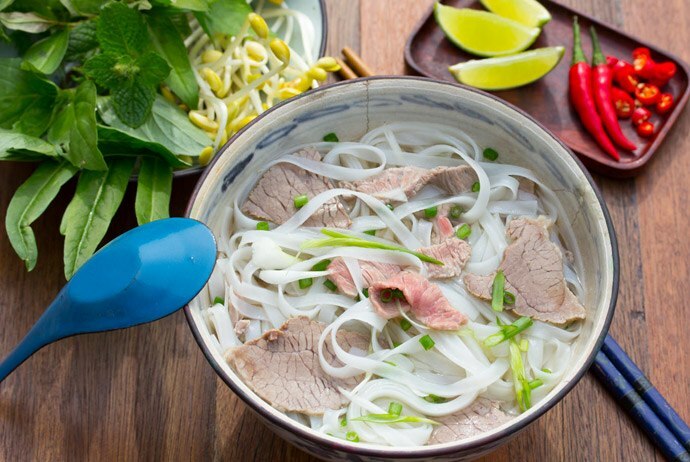 Actually, Pho is also one of the best street foods in Saigon tourists should try! The bread is usually baked to be hot and crispy before getting an incision along its body and orderly stuffed with spices, butter, meat (or eggs, meat pie, pork, char siu, etc. ); some vegetables (cucumber, cilantro, scallion, etc.) will be put up on the stuffings and the available sauce (chili paste, soy sauce, etc.). Nowhere else can have more types of sweetened porridge/soup than Saigon. Featuring as the land gathered by many settled population sources, Saigon sweetened porridge is extremely rich in flavor, color, and “genre”. The cooking world commented that Hanoi sweetened porridge focuses on flavor; Hue sweetened porridge focuses on ingredients, and Saigon sweetened porridge is the sparkle blending of colors. 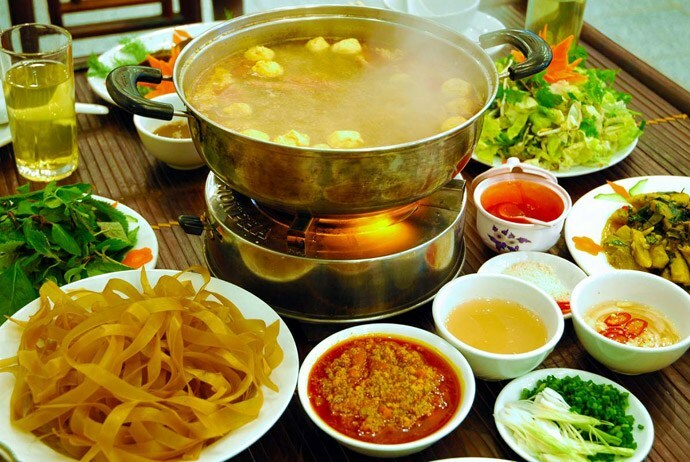 Since a long time ago, Vietnamese viscera soup has been considered as a delicious rustic snack of people in Saigon. Strangely, from children to the elderly, everyone can be “addicted” to this dish. Pha Lau is actually a dish made from animal’s organs. 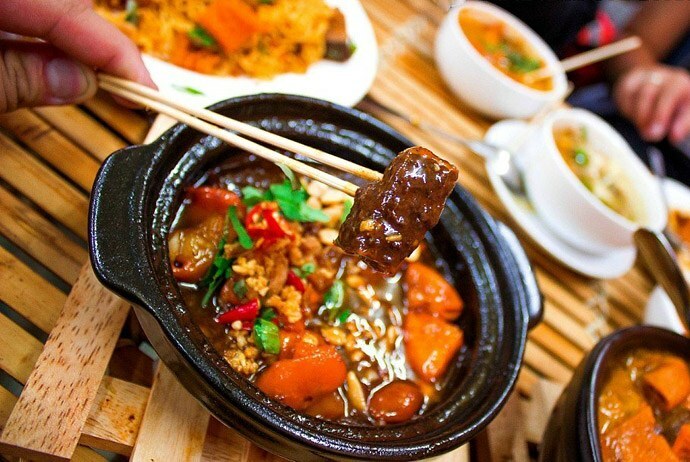 There are many types of Pha Lau: pork, poultry, beef … Beef viscera soup is the dish that people like the most. Perhaps people will not feel familiar when they eat this dish the very first time, but since the third time tasting it, they will be actually “addicted”. This is also the best street food in Saigon. This dish can be caught up anywhere on the streets around Saigon. 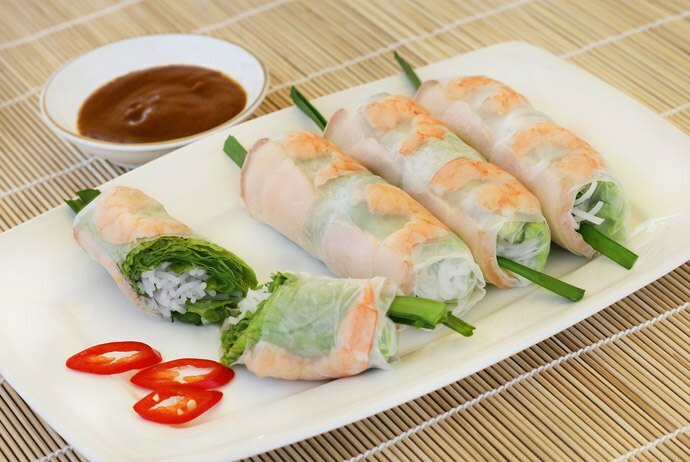 Just a thin rice paper for the outer layer and some boiled, crustless shrimps, lean pork, vermicelli, raw veggies, Chinese chives, and a small cup of dipping sauce, fresh rolled salad become a favorite snack of many people. The essence of this dish is in the dipping sauce. Each diner contains their own secret sauce prepared separately for each type of the rolled salad with unmistakable flavor. In Saigon, this dish is changed a little bit in the taste: thinner outer layer, butter used instead of sergestidae paste… It does not contain a lot of picky ingredients; just a few quail egg (or chicken eggs), crushed meat, fried onion …make this aromatic crispy grilled dish the choice of many young people, especially in the afternoon when it suddenly rains. Many people become the “followers” of fried dough because of the familiar-but-strange taste in the blending of cassava flour, rice flour, and eggs. 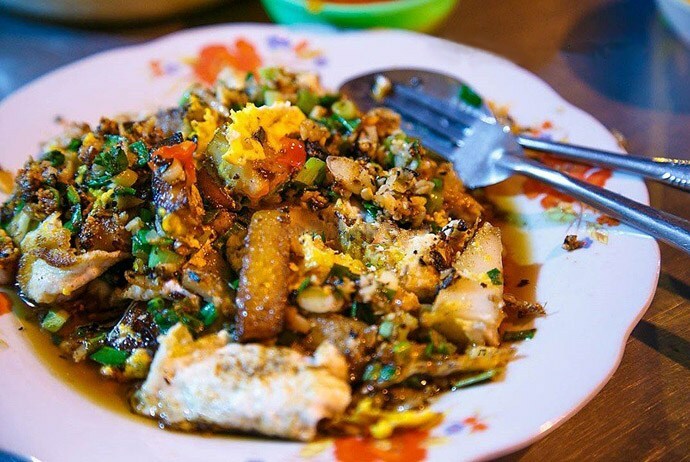 A plate of fried dough consists of rectangular pellets were fried up, mixed with scrambled eggs, scallion, and shredded papaya and cassava. In Saigon, there are many diners which sell traditional fried dough, such as the ones in Vo Van Tan Street (District 3) and Pham The Hien Market (District 8). This is also a great street food in Saigon people should try. Being processed in many ways depending on the diners, but the most popular fried vermicelli is still the vegetarian vermicelli served with bean sprouts, cabbage, fungus, tofu, and crispy fried meat pie. This dish is light so many people love eating it and selecting it as the breakfast. The taste of Bun Xao is mainly determined by the vermicelli: they must be thin, fleshy, chewy, but not too dry. Fried vermicelli can be easily found on the street around Saigon. 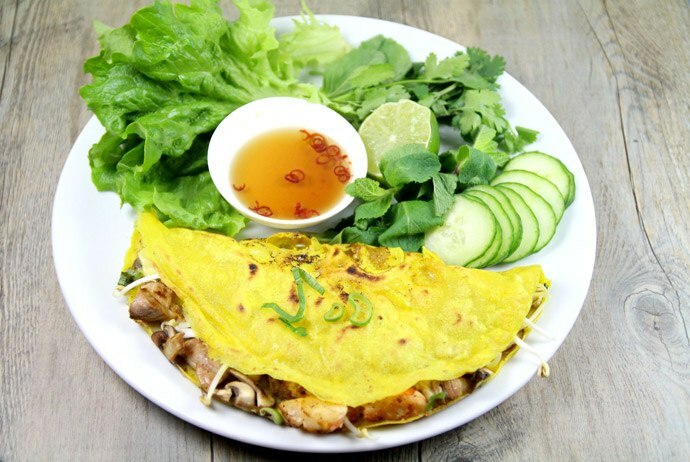 As one of the common breakfast which are very popular in Saigon. 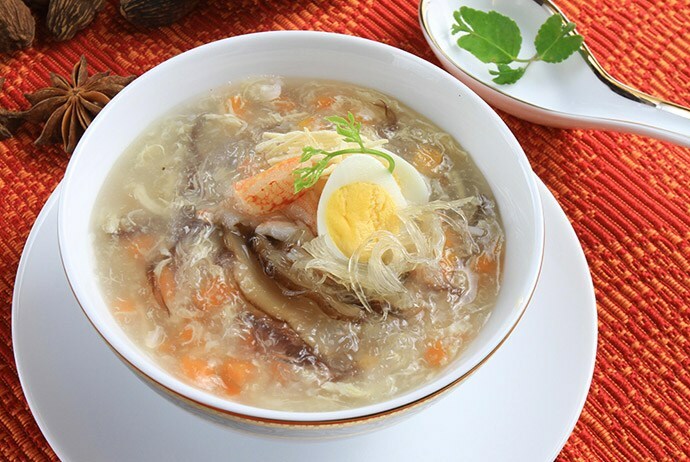 With the main ingredients including crabmeat, mushrooms, bamboo shoot flour, and quail egg, plus spices, such as cilantro, pepper powder…People who enjoy the dish at the first time will feel a little bit strange due to the taste of the crab soup, but will be quickly “addicted” to this nutritious and delicious dish. In Saigon after rainy afternoons, the crab soup diners in the alleys attract even the busiest person with its special and delicious taste. As one of the popular rustic dishes with the simplest ingredients, mixed shredded rice paper (or “Banh Trang Tron” is the just the shredded rice paper rolled with dried shrimp, teared marinated squid, and quail eggs, but when it is mixed with soy sauce and laksa leaves, bringing about a special dish with quite delicious taste which does not make people feel cloyed or greasy. Although it is not highly nutritional, the mixed shredded rice paper so far is among the top snack choices of the youth in Saigon. 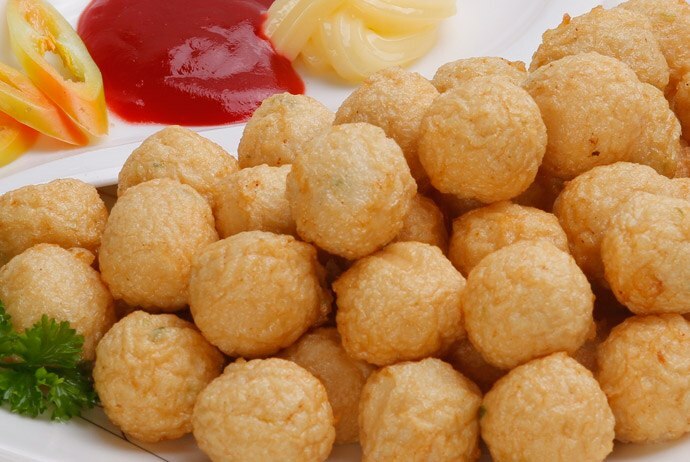 Perhaps no other snack is sold on the streets in Saigon rather than fried fish ball. Virtually, in any corner of Saigon, from the alley to the downtown area, we can easily find the signs of the carts selling fried fish ball. 4-5 fish balls will be strung on a skewer. When the customers come and buy the dish, the sellers will take the skewers and place them in a hot pan full of oil. After 5 minutes, the customers will have hot, delicious skewers of fried fish ball served with chili sauce – a tasty and addictive street food in Saigon you should try once in your life when coming to this city. 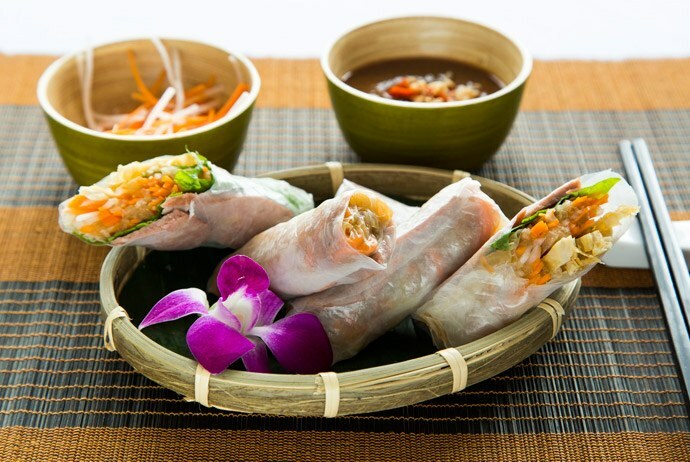 Often being confused with spring rolls, Vietnamese popiah requires a little bit more sophisticated cooking process. Originated in China first, over the years, Saigon Popiah has been changed gradually with some variables, but there are still 5 main ingredients in the dish: sausages, dried shrimps, egg, shredded cassavia, lettuce, and rolled out with a thin rice paper layer. This dish is regularly dipped in customized soy sauce.